GIORGIO ARMANI jacket, TOMMY HILFIGER sweater, and DAVID YURMAN necklace. ERMENEGILDO ZEGNA COUTURE jacket, shirt, and pants. Can you remember the last time you saw a camcorder? One of those big, hunking things that you’ve got to grab with two hands and hold up to a squinting eye? Right now, there’s a good chance you have a phone in your pocket that can produce images of far better quality. These machines aren’t exactly ancient, but they’re still a kind of modern antique, formerly ubiquitous, part of the texture of everyday reality, now long gone. Seeing one today, you might think about how advanced we had thought we were, how far we have come in such a short time, how far we may still have to go. I saw a camcorder recently, for the first time in at least a decade, at a photo shoot in the Brooklyn Navy Yard. As I walked into the room, full of fellow millennials checking their iPhones, the incongruity of the antiquated device struck me immediately. 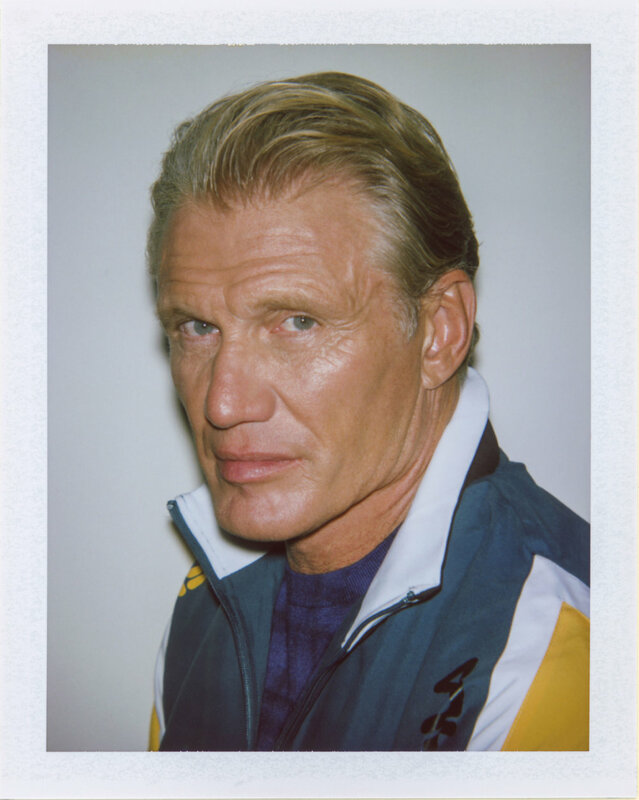 And then I see the man the camera was filming, another incongruous sight here in the second decade of the 21st Century: the ’80s action star, He-Man himself, Dolph Lundgren. LANDLORD X ALPHA INDUSTRIES jacket, LOUIS VUITTON shirt and pants, and DAVID YURMAN ring. Lundgren stands on a rotating platform before an orange backdrop, under heat and light, looking like an action figure in a microwave. He’s not an old man, but he seems to have stepped out of a bygone era, when muscle-bound hunks filled the multiplexes, gunning down everyone in sight. That sort of action movie, that variety of masculinity, those violent, patriarchal values: millennials surely remember all that, too. 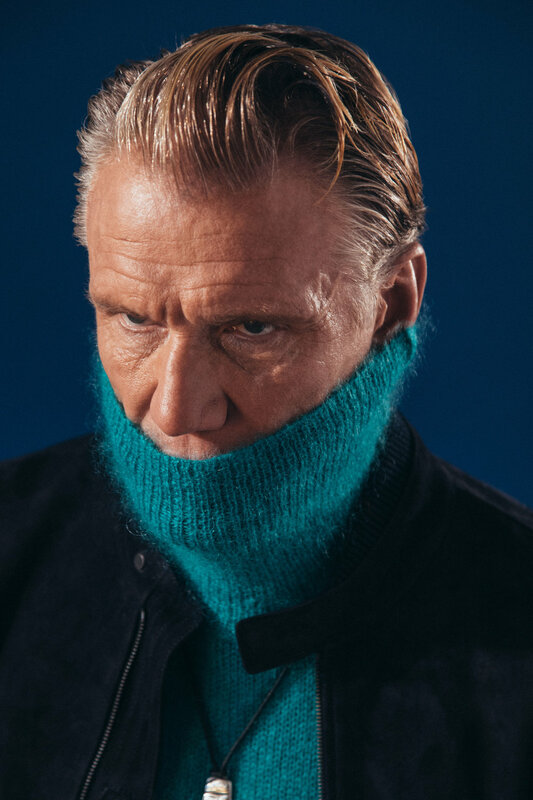 It’s all laughably out-of-step with the values of today, unless they come with a tongue firmly planted in-cheek, as in The Expendables series, which happened to have resuscitated Lundgren’s Hollywood career after a decade in direct-to-video limbo. I remember the first time I saw Lundgren. I was at home in the middle of the day, too sick to go to school. A basic cable channel was running a Rocky marathon, and I watched the whole thing. 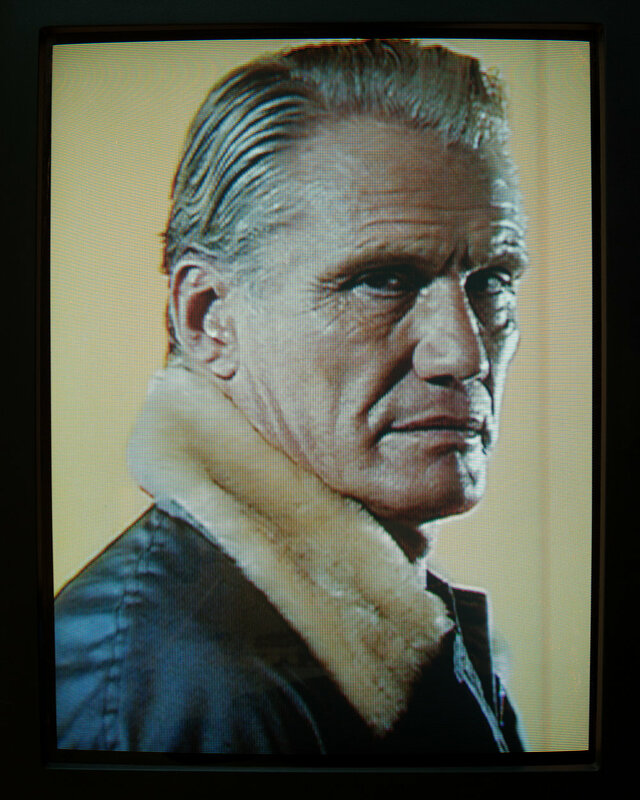 Although he speaks only nine lines of English, Lundgren plays one of the most iconic villains of the series: Ivan Drago, the looming, silent Soviet boxer who beats Apollo Creed—Rocky’s rival-turned-mentor—to death at the opening of the fourth installment of the series. During the shoot in Brooklyn, as Lundgren flexes and repositions himself, his mechanical movements reminded me of a scene in Rocky IV, where Russian scientists use computers to measure Ivan Drago’s heart rate and punching power (an inhuman 2000 psi). 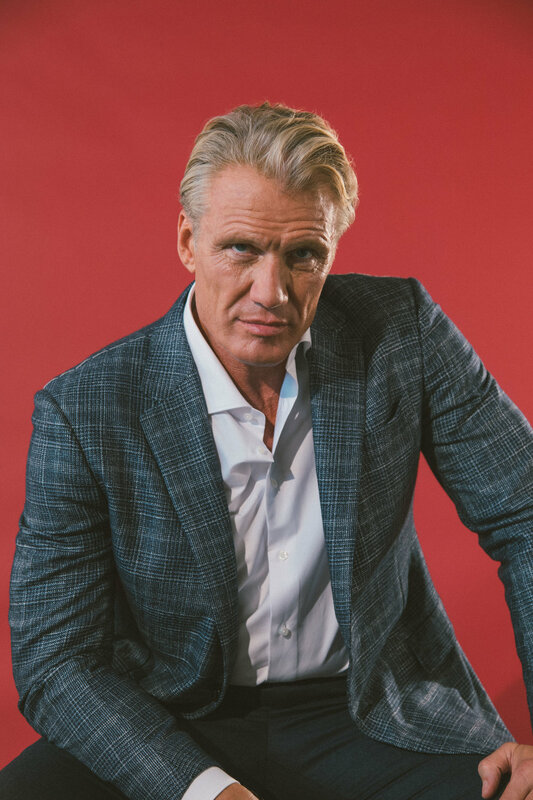 Rocky IV was what Lundgren called his first “real picture”; thirty-three years later, he will appear as Drago again in Creed II, his 70th role. Lundgren glowers like the professional villain he is, menacingly twisting his pinky ring. Then, all of a sudden, he rolls his eyes and sticks out his tongue, and the room breaks into laughter. He chit-chats amiably with the makeup artists, talks lovingly about apartment-hunting with his daughter. He cheerfully inquires about the camcorder, as surprised as I by its presence. When the shoot wraps, he compliments everyone and poses for Instagram pictures. And when we hop into an Uber back to Manhattan, I find myself conversing with a thoughtful, open individual, nothing like the macho man persona of his movies. ERMENEGILDO ZEGNA COUTURE jacket and LANDLORD sweater. LANDLORD X ALPHA INDUSTRIES jacket and LOUIS VUITTON shirt. FILA jacket and ERMENEGILDO ZEGNA sweater. It’s not exactly what I expect from Ivan Drago or He-Man. But if you ask me, confronting your trauma so openly, baring your emotions so plainly, is far more manly than punching harder than anyone else has ever punched. It’s also a sign that Lundgren is a dynamic actor and person. As the culture has evolved, so has he. Though he still gets to shoot a few people, when he needs to.